Take a look at this beautiful sweater. That's obviously a white 'Lady Liberty" Rangers sweater. It's from my personal collection and was purchased for Christmas 1998, during the same (and only) season this jersey was worn. Take a look at Wayne Gretzky wearing that jersey in his final NHL season. Other than the obvious game-used vs replica differences, did you notice the collar? The replica jersey has blue on top and red on the bottom, while the actual jersey has the red on top and the blue on the bottom. It seems as if the original replicas were made incorrectly, with the blue at the top of the collar. In the late 90's Starter was making the jerseys, so I assume Starter later changed the orientation of the collar to the proper layout with the red at the top. 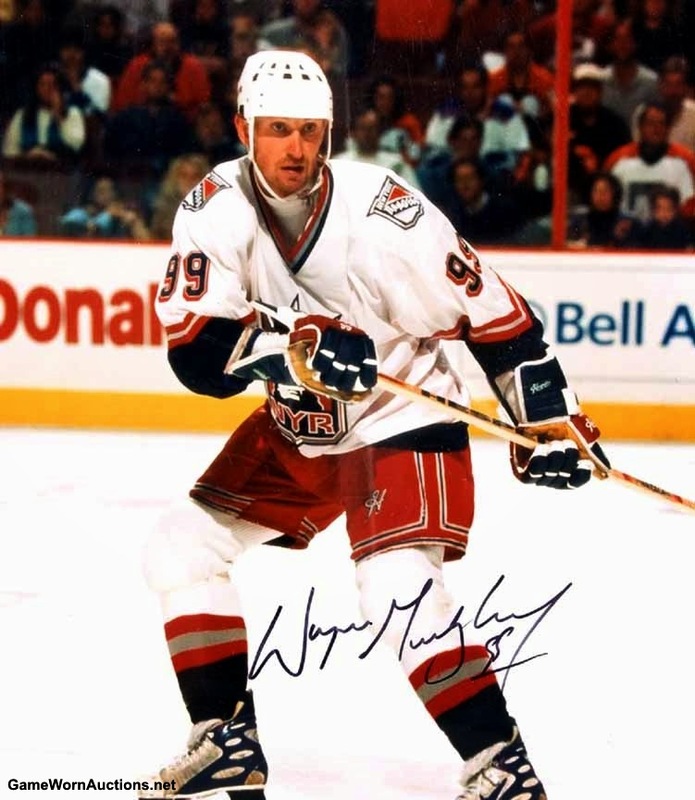 I can only assume, but I would say by the time Starter got the initial run of proper jerseys completed the Rangers had already submitted plans to return to the blue Lady Liberty sweater for the 1999-2000 season. Starter likely stopped any further runs of the white jersey and prepared for the re-release of the blue one for September 1999. Having a white Lady Liberty jersey is rare in itself, but having one with the correct collar colour orientation would be even rarer! Again, these are just theories on how rare these jerseys are and how they were produced, yet still a neat discovery for me. The good news for HJC readers is that I am in possession of a white Lady Liberty jersey as well. This second jersey has the proper collar orientation and will be part of the raffle at the HJC Meet-Up. Interested in showing up now? You can download the intent form here and you will be sent a ticket.